Lakecliff is located in Hood River, 60 miles east of downtown Portland or 45 miles from Portland International Airport. Take 84 East to The Dalles – watch the mile markers – we are at Exit 62 – Westcliff Dr. Take the exit, which is the first of three exits for Hood River. Take a left at the stop – crossing over the freeway. At the stop turn right onto Westcliff and we are the first driveway on the left. Sixty miles may sound far, but if you have not seen the Columbia Gorge, you are in for a treat. 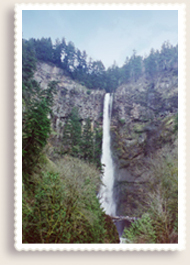 At Marker 17, you enter the Columbia Gorge National Scenic Area – and is it ever scenic. River on one side – basalt rock formations and waterfalls on the other. On your way up or back, be sure to take a little extra time and follow the Historic Highway route. You can exit at either Exit 17, heading east or Exit 35, heading west. You will see at least four wonderful waterfalls – including Multonomah Falls. Don’t miss the Lodge – built by the same architect as this house – Albert Doyle. You will visit Vista Point, which will give you a wonderful top-of-the-world perspective of the entire area.